Original Hawaiian Snoball– Shaved ice covered in our homemade flavoring, over 100 flavors to choose from. SnoSlush– Your favorite snoball blended into a slushy drink. SnoFluff– Your favorite snoball with marshmallow on top and bottom. SnoShake– Your favorite snoball blended with soft vanilla ice cream. SnoSwirl – (formerly Avalanche) Your favorite snoball with soft ice cream on the top and bottom. Italian Ice -Soft, smooth flavored ice. Fat free, and cholesterol free. Gelati– Our Italian ice is homemade. We carry 12 smooth , rich flavors everyday. 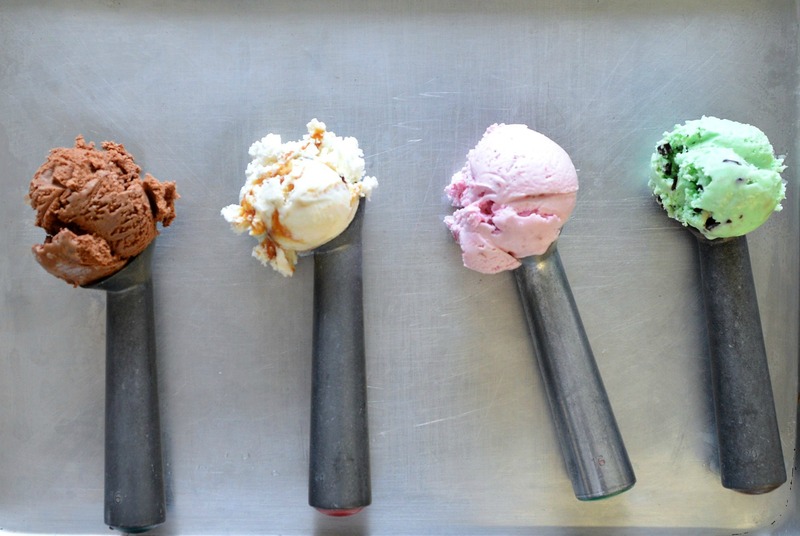 Hard Ice Cream -Hand-dipped ice cream, 14 flavors to choose from. Sundaes– Many types to choose from. 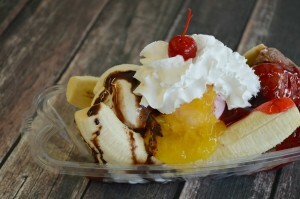 Hawaiian Hurricane– Soft ice cream blended with your choice of toppings. Floats– Soft or hard ice cream, topped with soda. Milk Shakes– We have a wide selection of milk shakes, malts, fruit shakes and gourmet shakes! Soft Pretzels– We offer unsalted, and salted. What is an Original Hawaiian Snoball and why do I need to drop everything on a hot day to find one? 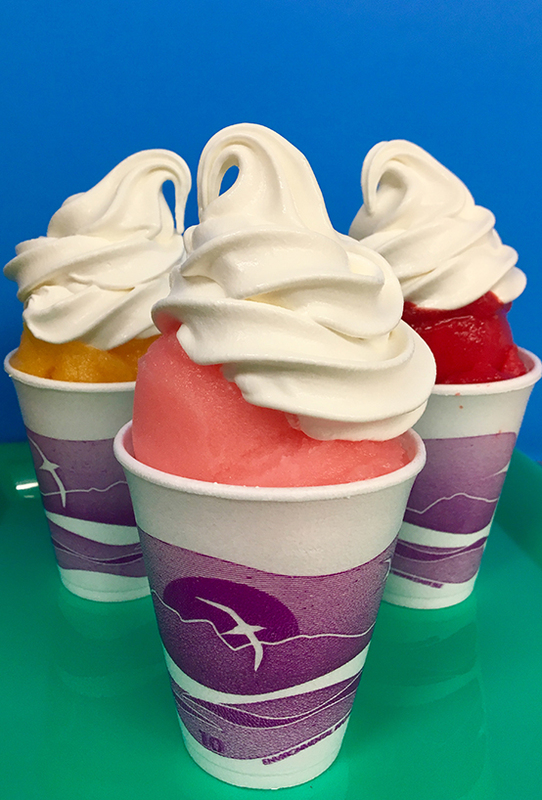 Our Hawaiian Snoballs are made from finely shaved ice. We top the ice with the flavoring of your choice. We have a wide selection of flavors that can not be found at other snoball stands. Snoballs are fat free and cholesterol free. We also have a wide selection of sugar free flavors for our diabetic customers and those who are watching their figure. Popular toppings include marshmallow, ice cream and whipped cream. All of our flavoring is homemade, one bite and you will be able to tell the difference between our homemade flavoring and the others. What makes your ice cream different from the rest? I thought ice cream was ice cream. Our soft ice cream is rich, creamy and delicious. We use the highest quality ice cream possible. Many of our competitors use ice milk, or ice cream made from chemical additives. Not us! We use 100 % real ice cream. What are the most popular snoball flavors? Come see for yourself why we’ve been a Baltimore favorite for the past 25 years. We are easy to find at 10636 Liberty Rd (near the Liberty Reservoir between Eldersburg and Randallstown!